Access from Vail : Exit I-70 at Vail exit 176 and on the North side of the interstate turn right (East) onto the Spraddle Creek Road #737. There are two parking areas. The first is Forest Service access parking, 0.1 mile up Spraddle Creek on your left. To reach the second parking area, continue east up Spraddle Creek for 0.75 miles to the Spraddle Creek Estates entrance gate. Take a hard right before the Spraddle Creek Estates entrance gate and continue 0.1 mile to the Spraddle Creek Ranch parking area. Do not park at the Spraddle Creek Estates entrance gate. Attractions/Considerations : This trail offers outstanding views of the Vail Ski Area and the Gore Range on its way to the Eiseman Hut. Eiseman Hut is part of the 10th Mountain Division Hut Association system and can be reserved in advance at www.huts.org or (970) 925-5775. The winter-only trail is marked by blue diamonds and is closed to snowmobiles. Trail Highlights : From the gate at Spraddle Creek Ranch, follow the road north and then East along Spraddle Creek roughly 1.8 miles to the Eiseman trail. The route is marked by blue diamonds and climbs gently while crossing streams at 0.1, 2.3, 3.3, and 3.7 miles. 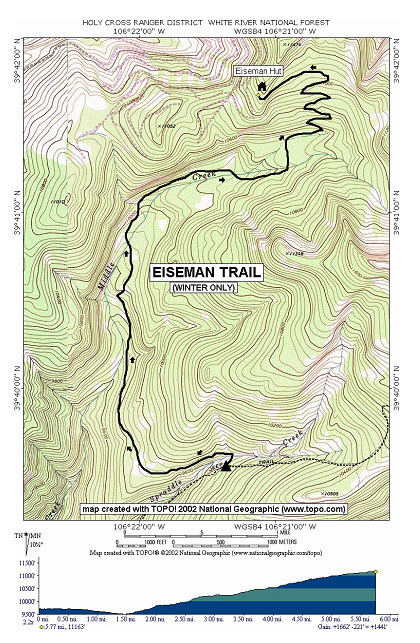 At about 4 miles, the trail begins climbing more steeply up switchbacks to Eiseman Hut.